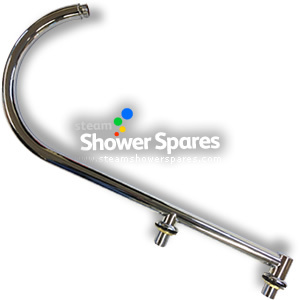 Chrome finished 'J' shaped water supply tube for use with monsoon / overhead showers. Comes with two fixing point threaded ends along the straight part and a threaded end for connection to the swivel joint/ball socket. This part is fitted to models bearing the H88-84* code and also AquaLusso Crystal range of shower cabins.